for women’s voices by Guthrie Foote. This cantata for Women’s Voices brought together two vital elements in Vaughan Williams’ musical character: his strong support for amateur music making and his life-long love for English folksongs and folk-carols. The work was commissioned by the National Federation of Women’s Institutes for their first Singing Festival in 1950. It was the first time the National Federation had commissioned a work for a special occasion and Vaughan Williams was their preferred choice of composer. The performance of the cantata is excellent, but then one would expect nothing less from the veteran David Willcocks, 90 in December, but on this evidence still an energetic figure on the rostrum. A world premiere recording of works by Vaughan Williams is surely at this date something of a world event. Of the five Albion discs issued to date the most ambitious and exciting is this latest. The CD redresses a longstanding lacuna in the RVW recorded music catalogue. 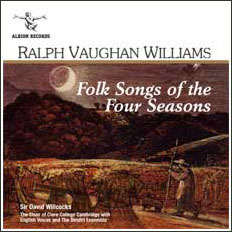 This recording is by a venerable doyen among the British choral traditions: Sir David Willcocks. Be assured, the roster for the ‘Ensemble’ takes it to full orchestra strength. This is not some cut–down chamber grouping and the listening experience bears this out very convincingly. RVW writes with light in his pen and light shines through these cleverly laid out and lovingly performed movements.